The recurrence of events and people in the climax is the biggest shortcoming of the film. The spontaneity of the story finishes at least 15 minutes before the actual finish, and it doesn't look very fitting after a nice build up. 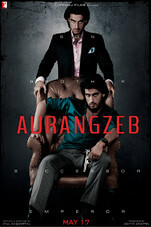 Overall, 'Aurangzeb' is a fun thriller with a racy first half and a dragged climax. It's not devoid of any essential ingredient of a 'masala' film and you can watch it for depicting the dark underbelly of the illegal land deals.